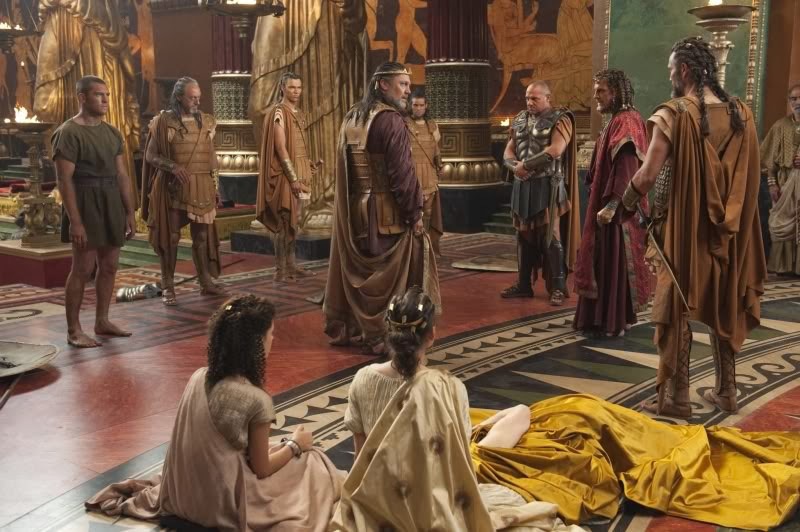 There's a trend in many new Sword and Sandal films to move away from the usual look of old films and make Greek stories or stories set in Antiquity in other exotic settings look more Medieval than anything their actual setting or customs or clothes. Personally, I don't like it one bit. This is probably due to the success of the LORD OF THE RINGS series and many film producers try to jump on the bandwagon and not go to the more accurate look. The new comic book KING CONAN; as someone who grew up with Frazetta and Boris Vallejo's exotic interpretations of CONAN this comic book cover is not really exotic. Looks like plain old King Arthur. The CONAN THE BARBARIAN remake was decidedly more Medieval looking than the original film. It was a big flop and the series is basically dead because of it. HERCULES (2005) mini-series starring Paul Telfer and Sean Austin didn't look Greek at all. Filmed in New Zealand the locations also don't look Greek. Bleech. The influence of LORD OF THE RINGS? Liam Neeson as Zeus in the CLASH OF THE TITANS remake. 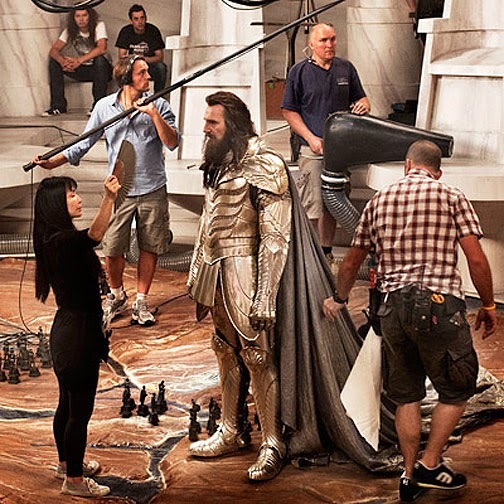 His armour looks like something straight from EXCALIBUR not Greek mythology. Below, also from the same film, looks like Robin Hood. Sorry, but Conan does not count. Aquilonia and most of the other Hyborian nations have a medieval or even Renaissance look and feel in the original stories written bei Robert E. Howard. The lats Conan movie was much closer to the original source material than both Arnold movies. Sorry, but Conan does not count, because in the original stories written by Robert E Howard Aquilonia and the other Hyborian nations have medieval look and feel. The last Conan movie was much closer to the original source material than both Schwarzenegger movies. And even the Conan comics by Dark Horse comics are much more faithful to the original source material than those published by Marvel. Like I said, the influence of Frazetta and Boris Vajjelo both of whom painted every cover of every Conan books for decades, makes it difficult to accept this dull Medieval look. The CONAN films and every Sword and Sorcery film of the 1980s were influenced by the Frazetta and Vallejo look which didn't look Medieval. Accurate or not that's the look of CONAN for the past 40 years. But…the remake was a flop, critically and financially. People didn't want to see it AND didn't see it so the fact that it's more accurate is pointless. It's a complete fail. People are used to the other way not a Medieval Conan. Nothing else to add to this. True, traditional 'peplum' is set in Antiquity -though in the wide (French at least) meaning the gender covers 'biblical' movies (*) and historical ones as well as 'sword & sandal' works, so not all costumes are of the Greek-Roman peplum / peplos type, so fashion and armor / weaponry actually varied. And the limit between 'peplum' and some medieval movies is blurry, it's more a matter of 'feeling' than actual chronology: not only the very Frazettan-looking 'Pathfinder' or the old movies with 'Wagnerian' vikings but even 'The ring of the Nibelung'and 'The 13th Warrior' for instance. Specially when the setting is spiced with some 'fantasy' element. But when it comes to movies (or comics, for that matter) taken from books you can't blame the visual designs for being faithful to their sources. This applies to Conan -by Hyborian times a good part of the world is of medieval level- as well as to most 'sword & sorcery' / 'heroic fantasy' works: these are explicitly 'pseudo-medieval'. I fully appreciate the beefcake and even more cheesecake of the Frazetta / Marvel tradition, but it sometimes totally betrayed the text to the point of making important details meaningless (re the differences of armor carefully pointed out in 'Black colossus'). Note that the almost 'Renaissance' trousers on the illustration you criticize are taken from the *1st* Conan movie (at the end) where indeed, given the supposedly hot climate, they were uncalled for. 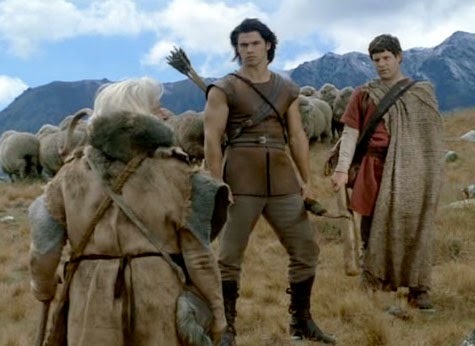 AS for the failure of the 'Conan' remake I doubt it had anything to do with the "Ancient' or 'Dark Ages' costumes: it was basically a pointless very bad remake, an awful movie. Medieval films fall under the PEPLUM umbrella. As long as there are sword fights in them it belongs to the genre. But what I don't like is story lines which are supposed to be Mediterranean in nature and are transported to Medieval-like settings. I disagree about the pants thing. I didn't mention anything about pants in my post even though Hercules in pants is always stupid, including the Sorbo series. Arnold wore pants in the original Conan and a lot of Italian Sword and Sorcery films like Gunan or Thor the Conqueror. The LotR influence I'm talking about has more to do with the tattered Robin Hood look. 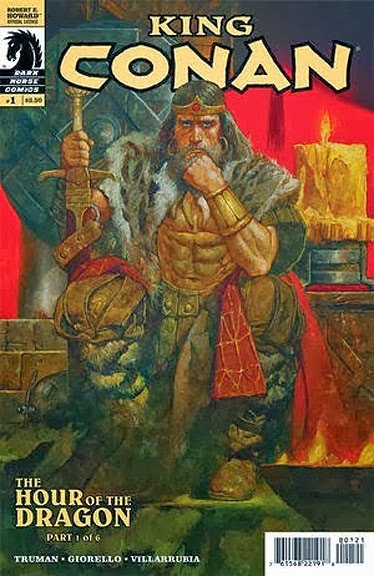 I know the image of Conan on the throne at the end of the first Conan film but this comic book cover, which was made this year, removed all 'Vallejo' aspects from it and made it more medieval. I've read the books and the Frazetta and Vallejo interpretations didn't bother me. In fact I loved them because they were so colourful and evocative, certainly Frazetta's work. For me it's not just about beefcake or cheesecake even though that's what make a PEPLUM a PEPLUM but it's more to do with the exotica. There's nothing very exotic about England and its countryside compared to any Mediterranean setting. I'd love to see a more accurate CONAN but without losing the exotic edge. The remake was awful but visually it was dull as dishwater.